Peanut butter cookies are a timeless American cookie. Growing up I can certainly remember making them a lot but we called them fancy peanut butter cookies. They sure did taste good but boy did they have a huge ingredient list! 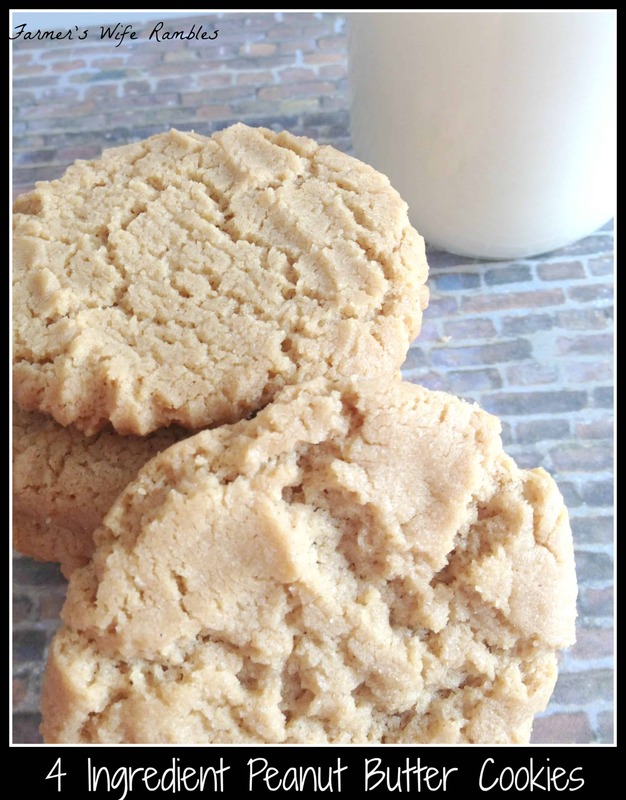 That’s what I love about these 4 Ingredient Peanut Butter Cookies. Yes you read that right, only 4 ingredients! These little treats are also perfect for your gluten free friends because they have no flour. I know pretty impressive that you make an amazing tasting cookie that stays soft without any flour. When I tell people about these cookies they are shocked that one of the ingredients is not flour. The combination of peanut butter and sugar is enough to keep these cookies together and they bake out pretty beautiful if I must say so. Drop by rounded teaspoonful onto baking sheets greased baking sheets (or use parchment paper). Bake 8-10 minutes. Allow to cool on cookie sheets for 2 minutes before moving to a wire cooling rack. Need more great cookie recipes? Last check out these 17 Must Have Cookie Recipes that are always great to have on hand. What is your favorite flavor of cookie? Enjoy baking classic cookie recipes or do you prefer the easier cake mix cookies? Love the simple and easy to follow recipe. Only a few ingredients that is awesome. Peanut butter cookies are my favorite. How easy are these. I love peanut butter cookies. Will have to try this recipe. These are such easy cookies to make and I know that I would love to have these for a nice treat for me and my family! I bet they taste delicious! Thanks for sharing! I have a huge jar of peanut butter, I was starting to think of what to do with it! This recipe is perfect! I’m so psyched to make these cookies!!!! I’ve never made peanut butter cookies without flour, so this will be fun!